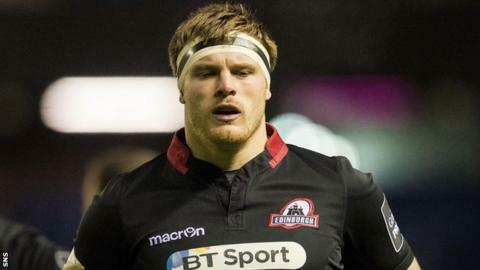 Edinburgh prop Grant Shiells believes Borders rugby is an under-exploited talent market, and that top youngsters are slipping through the net. Melrose-born Shiells, who featured nine times for Edinburgh last season, "would love to see" a professional Borders club reinstated if viable. "I think Scottish Rugby needs to look at it as a huge untapped source," said Shiells. "There are so many great players down in the Borders." There has been no professional club side in the south of Scotland since the Border Reivers were disbanded in 2007. "The Borders folk love their rugby," continued Shiells. "For them to not have the professional team is certainly less than ideal, to say the least. "The attendances to club games are not amazing, but if there was one big focus they had, I'm sure they would get behind us." The parochial nature of Borders rugby and its supporters, a traditional hotbed for the Scottish game, was referenced as one potential factor in the Reivers' demise. Former Scotland scrum-half and 1984 Grand Slam winner Roy Laidlaw told BBC Scotland he felt the Borders game, in some ways, had "gone backwards" in March. With an influx of circa £20 million via a BT sponsorship deal last year year, however, there have been renewed calls for Scottish Rugby to make another effort at kick-starting an elite club. "Back then there wasn't nearly so much crossover," countered Shiells. "Kelso boys played for Kelso, Gala boys played for Gala and that was it; that was the be-all and end-all. "But there's so much crossover now. Back in the day it was 'poached', boys were saying, 'Melrose are poaching all the good talent'." When asked which he would prefer, a new professional Borders team, or a purpose-built stadium for Edinburgh, Shiells replied: "There's no right or wrong answer, this is literally just my opinion. "Whether they could make it work is very, very debatable, and I'm certainly not the man to answer that. "But if you're going to put me in that position I would definitely see something happen in the Borders." He added: "I'm not going to say it would work, obviously it would be an expensive risk to take. I wouldn't be the one footing the bill for it if it didn't work, but I think it would definitely be interesting to see what happened." Shiells, 25, was a highly-rated youngster who had spells at Premiership sides Newcastle Falcons and Bath, and represented Scotland at Under-19, Under-20 and A level, is concerned that Borders stars of the future may be lost. Scottish Rugby have invested in four new academies, funded in part by the BT deal, one of which is based at Netherdale, former home of the Reivers. "Definitely," he replied, when asked whether young Borders players could be slipping through the net. "I think there are a lot of boys down there that should at least be given a crack. It's always hard to say, you don't know how boys are going to perform in a professional environment. "Sometimes the training's too much for them, some of them just don't have an interest in playing rugby at that level. "(Edinburgh team-mate) Rory Sutherland is a prime example. He went through all the age group stuff at Hawick, didn't really do an awful lot for Scotland age groups - I might be wrong there, but certainly he's never talked about it. "He played for Gala, got picked up. He's one good example that that's the sort of system they should have in place. "They should be looking for these kinds of boys, because there are a lot of them."